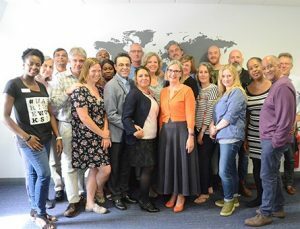 23 of us gathered at the weekend in Birmingham at the FamilyLife Facilitators Training (16 of us were trained the rest were doing the training) There were so many highlights from the weekend. My personal highlight is that we had trainees whose home countries (and resident countries) spanned Jamaica, India, Sweden, The Netherlands, Belgium, America, Iran and The UK (hope I didn’t leave anyone out!) It’s brilliant that we are able to continue to build a team of diverse facilitators in order to reach a diverse range of couples. But the other key highlight, as it always is, was hearing the couples give a ten minute section of one of the talks on the Sunday morning. All weekend they listen and (hopefully) learn the ropes and then on Sunday they have free reign to get up and have a go themselves. There are always varying degrees of nerves in the room and varying degrees of experience, but without fail they produce material that is clear, personal and full of honest stories. The main comment we receive as a team when we run A Day Together events is a variation on the theme of ‘it’s good to know we’re not the only ones who argue all the time/can’t cope with the in laws/are so extremely opposite we can’t believe we got together’ etc. etc. What couples appreciate so much is honesty and vulnerability from the couples up front. They don’t want experts to tell them what to do, they want to a couple who says ‘we struggled in this area, but we came through (or we are still coming through! )’ And that’s what we offer them in spades. At the weekend we heard from a couple who really celebrate every anniversary together because staying together is an achievement, one couple who are so different that one partner can’t get enough exciting adventures and the other wants to stay home with a bag a knitting, a couple for whom the experience of one partner becoming a Christian caused great disruption and difficulty in their relationship and a couple whose personality types have meant issues have gone undiscussed for 18 years. As I sat listening to these 8 couples share from the notes they had hurriedly worked through in just one evening I felt two things. One, excitement – I so want to hear the end of the stories these couples started telling and two, immensely proud of each and every one of them.